The 2013 Geminid meteor showers in the northern hemisphere. Photo by Asim Patel (CC). This December features one of the best meteor showers of the year. During the peak of the shower, you may be able to see as many as 120 shooting stars per hour, one of the highest rates of all the meteor showers throughout the year. Unfortunately, the peak of the shower is around the full moon but the shower is so bright, you’ll still be able to see lots of meteors. 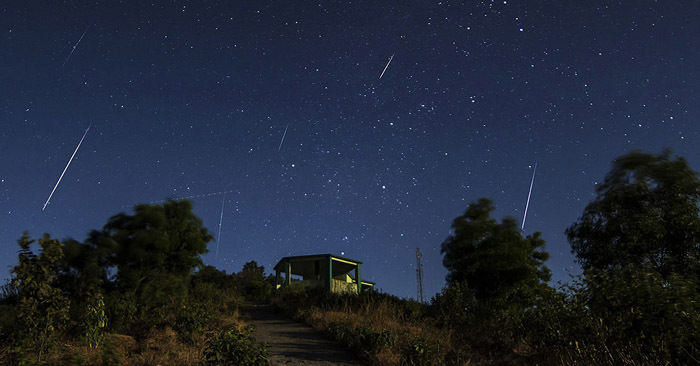 What Causes the Geminid Meteor Shower? When’s the Best Time to View the Geminids? Luckily for us, the moon will be a thin crescent and only seen in the early evening hours. This creates excellent conditions for seeing the meteors streak across the sky. Beware, this shower does slightly favor the Northern Hemisphere for best viewing. The shower is best viewed around 2 a.m. locally. This is when radiant point – in the constellation Gemini – is highest in the sky. What’s the Best Way to View Them? Make sure that you’re away from light pollution in a dark place – the darker the better – with a wide angle view of the sky and few obstructions on the horizon such as trees and buildings. Wear warm clothes and bring a blanket. Viewing is best lying down. You don’t have to look toward the radiant to see the meteors and you don’t need binoculars or a telescope. Rather, try to view the largest amount of sky possible. Be patient. It’ll take about 20 minutes for your eyes to fully adjust to dark. Just lie back and enjoy!